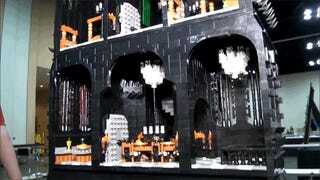 You’ll need a ladder to fully see everything in Brenden McMahon’s LEGO version of Saruman’s tower, a.k.a. the Tower of Orthanc, from The Lord of the Rings. The official 2359-piece version isn’t small either, but this one makes it look like a holiday cottage. The tower has nine individual floors with a torture chamber, grand halls, a library and everything a wizard needs. And the whole set is wired for lighting. No wonder it took home the “Best Mega Creation Award” at Brickworld Chicago. Check out the creator’s Flickr gallery for closeups but The Brick Show’s video shows all the floors and every little detail as well. And here’s an interview by Beyond the Brick with the creator.